Suisun City is an interesting place. Not far from Napa, this little delta-side town has a life all its own. Lots of little restaurants, bars, and a packed calendar of events on the waterside. We had heard people talk about a new restaurant there, but for the life of me I couldn’t think of where they would put it. I had been to all the places in this tiny town. I prefer to spend my money in Napa for anything more than a quick meal or snack. However, we decided to give this place a chance on the recommendation of friends. We went for dinner with our niece and her boyfriend. It was a Saturday night and pouring down with rain. Parking was really full all around the restaurant, but luck was with us and we managed to find a place right outside the door. Our first impression walking into the restaurant was not good. I will tell you this now, I wanted to leave. The place was a bit shabby, and filled with smoke. We saw our party and we sat with them. Things didn’t really improve with our waiter who, although charming and friendly, was a bit scatter-brained and didn’t know the menu well. It seemed like it was his second day, but he told us he had been there for a while. Then there was the smell of burning plastic that wafted through the restaurant. At this point I really did want to leave, but we were actually the guests of our niece and her boyfriend; so I didn’t want to be rude; though I was thinking “Let’s get out of here!” Looking at the menu, it was relatively expensive, which wasn’t filling me with confidence to stay. I didn’t want the kids to spend the money on a horrible meal. The Brit comments: The restaurant interior was stark and open to the kitchen, which probably explained why the smell of smoke permeated the room. The tables were wood, with paper table runners. The overall decor did not reflect the quality of the menu. We ordered our food. The waiter seemed to manage our order pretty well. We did have a small spill at our table and after a very awkward exchange the waiter did realize the table needed to be fixed and the paper on it replaced. Finally our meals arrived and I couldn’t have been more surprised. All four were beautiful dishes. I couldn’t believe they came out of this restaurant. We took pictures and all hungrily dug in. They tasted as wonderful as they looked; flavorful, filling, American cuisine, with a modern twist. The chef nailed it! 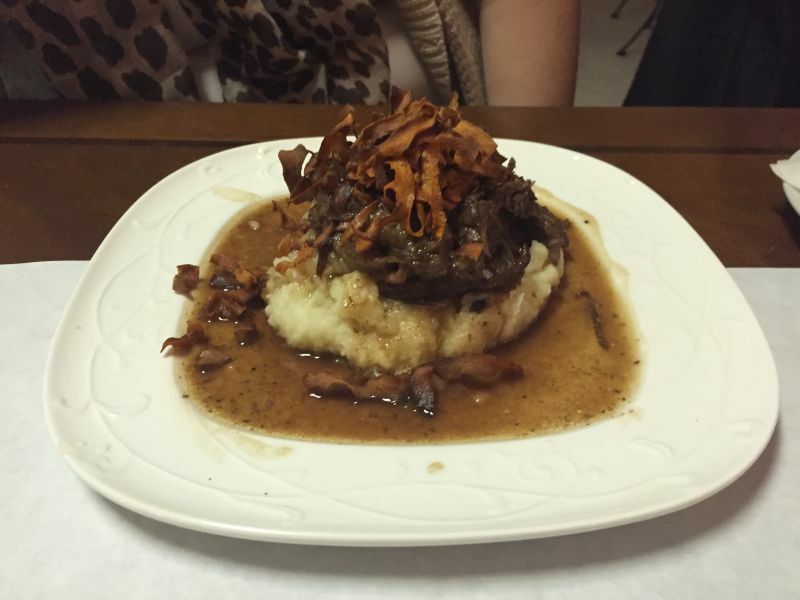 Braised Beef Short Ribs with mashed potato and golden fried beet garnish. This was devoured by my niece who raved about it. I tasted it and it was absolutely delicious. The fried beets adding just a bit of sweetness and crunch; lifting the dish and taking it out of ho-hum to great. Pork Chop with Bread Pudding and Brussels Sprouts – another spectacular dish. I loved this paring. Clever clever! 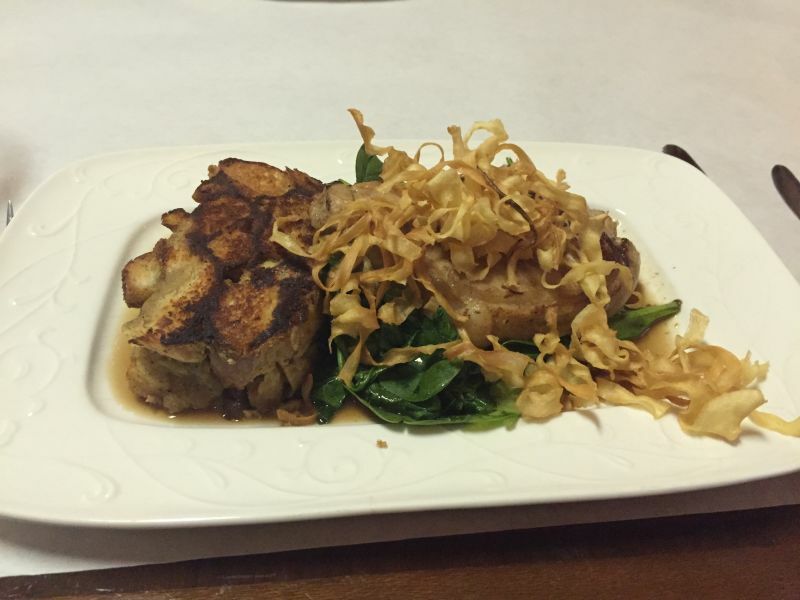 The savory bread pudding with the beautifully cooked tender pork chop was truly outstanding to my palate. I loved the bite I had. The Brit comments: You may notice in the picture of the Pork Chop that there is a noticeable absence of Brussels Sprouts. I was one of the two people who ordered this dish. I have a strong dislike of Brussels Sprouts and so I substituted Spinach. The Spinach was cooked without removing the flavour; a common problem in my experience. The Bread Pudding had a layer of mushrooms, that gave variety to the texture and flavour. It was a wonderful starch that complemented the juicy Pork Chop. 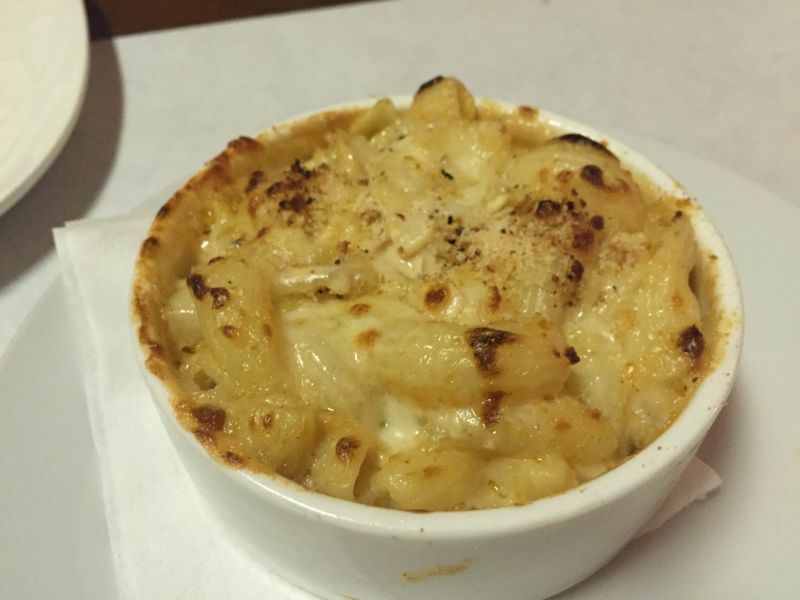 A side of Mac n Cheese – Delicious! Creamy, cheesy, with a wonderful spicy kick at the end. I could have made an entire meal just of this dish. 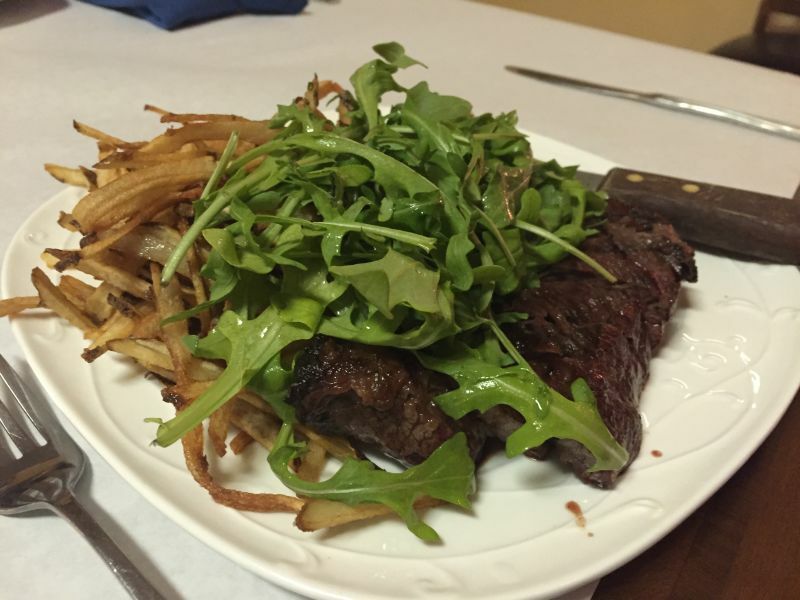 Hangar Steak – This was my plate. It was cooked beautifully. It was the least favorite of the things we had ordered. I don’t know what it was, it just was lacking in some way. I am unsure if that piece of meat was just not wonderful, or what. It wasn’t bad, it just wasn’t a wow. The fries however were great! The guys loved them. Their food was excellent. I am sure there was some issue in the kitchen when we came in, because of the smoke and the smell. No one could produce that kind of quality food and be a disorganized chef. However, I have to say that there are things that should be addressed. The cleanliness in the restaurant was lacking. We were served ketchup from a bottle that was dripping sauce down its sides. I had to wipe my silverware. The waiter was having issues with basic things, like bringing sweetener for the iced tea and following through on bringing dessert menus. When we asked him questions about specials, he seemed a bit lost. Drinks were not refreshed. All this being said, it seemed as though this was a bad night for them, and we will come again and revisit them on another night. The food was great. The Brit comments: The waiter was friendly, but as California Girl says, he was vague about the menu, failed to keep drinks filled, needed to be reminded about sweetner for iced tea, and forgot to bring us dessert menus. On balance, the deficiencies in service and decor were more than compensated for by the excellent food. Nowhere else in Fairfield or Suisun have we had such good and interesting food. I will have to try this place with Amy next time I am there! I am hoping to revisit the restaurant soon and hopefully the little issues they had will be fixed.